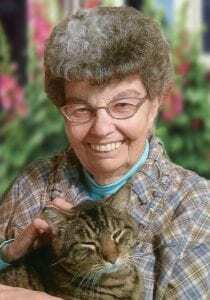 Elma Marilyn Mangin, 86, of Gettysburg, died Sunday, Jan. 13, 2019 at her home. Funeral services will be 10:30 a.m., Saturday, Jan. 19 at Emmanuel Lutheran Church, Gettysburg with the Rev. David Otten presiding. Burial will follow in the Gettysburg Cemetery. Visitation will be one hour prior to the service. Elma and her twin sister, Amy, were born on Feb. 9, 1932 to August and Pauline Maas at their grandparents’ house in Gettysburg. She attended Fuller County School and Gettysburg High School, graduating in 1949. She received her teaching certificate from Northern Normal College followed by four years of teaching at area schools. Having made good on his year-book promise to provide safety-pins should she ever have twins, she married Richard Mangin, July 25, 1954. No twins, but six individual blessings were born to this union. They resided on the family farm northwest of Gettysburg where Elma stayed busy raising kids, chickens, calves, cats and telling Theodore stories. Elma was a member of Emmanuel Lutheran Church where she taught Sunday School, was a member of Mission Guild, choir, and wrote Dial-A-Devotion for many years. She was a life-long member of Lincoln-Appomattox Extension Club, Cancer Society, and a 4-H Leader. Elma is survived by her children: Vicki (Larry) Rausch, Bismarck, ND, Lori (Monty) Harer, Hoven, SD, Tim (Angela) Mangin, Surprise, AZ, Tom (Theresa) Mangin, Greenville, WI, Brenda Forman, Pierre, SD, and Todd (Georgia) Mangin, Gettysburg, SD; brother, Kenneth (Dorothy) Maas, Aberdeen SD; sisters-in-law: Miriam Maas, Gettysburg, SD and Dona Brenner, Wilmar, MN; grandchildren: Leslie (Brian) Cooper, Kimberly Harer, Justin (Heidi) Harer, Anthony Rausch, Stephanie (Brock) Magnuson, Ashley Turner, Cody (Abigail) Mangin, Caitlin (Kevin) Stiles, Roberta Forman, Adam Forman, Joseph Mangin, and Caleb Mangin; step-grandchildren: Stefanie Huckaby and Josh Magnin; great-grandchildren: Wyatt and Ainsley Cooper, Sutton, Landon and Marshall Harer, Hunter Mangin, and Calvin Turner; and step great-grandchild, Madden Huckaby. She was preceded in death by her husband, Richard; parents: August and Pauline Maas; her twin sister, Amy Lake; brother, Vernon Maas; father and mother-in-law: Joe and Kathryn Mangin; and brothers-in-law: Jim Lake and Albert Brenner.